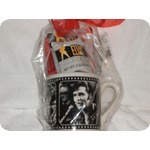 Elvis Presley photos a large super size white mug with coca and candy that is gift wrapped in clear plastic. An EPE product with tags. Last one.